Well, they DO have a British post-punk/power-pop vibe, but have no mistake - they are all Americans. From their 2005 EP out on V2 Records - here's TV Riot, with special guest Pete Shelley (from the legendary Buzzcocks). 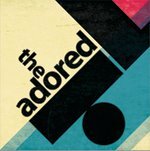 "The Adored were born when four best friends and bon vivants joined up to make spiky party music combining elements of early punk & postpunk with elements of new wave, power pop and '90s Britpop. Ryan (vocals) and Nat (drums) met in the mid-90s in NorCal and both played with a locally legendary punk band before moving southward. They met East Coast transplants and aspiring popsters Max (bass) and Drew (guitar) in Los Angeles in 2002 and immediately started writing and playing together ."